Watch The DVD - Included in th box with your table. We recommend that for assembly and for anyone who is going to use the table to view the DVD (before trying to assemble or use the table). We also recommend that the safety strap be attached at all times, except those times when full inversion is desired (which may be never). Please use good judgment and check with you doctor if you have any questions. Congratulations if you have decided to purchase the EP-550, Teeter EP-960 or Power VI Inversion Table. Our company was the first in the world to market this type of equipment on a nationwide and international basis to the general public. We have also supplied medical professionals since 1980. Based on this experience we believe you will be very very happy with your purchase. As well as being an excellent piece of equipment the results we have seen are absolutely marvelous. However, overdoing inversion therapy the first few weeks can cause pulled muscles and other problems. These problems resulting from not going slow may DELAY the potential benefits of inversion therapy. Most people have not hung upside down since they were little kids. One of the few side effects we have observed is a pulled muscles from over stretching the muscles, nerves, tendons, ligaments etc. of the back and neck. It may be fun to hang at extreme angles and do sit-ups and twists etc. but it is not fun to wake up in the morning with a wicked charley horse in your back and be hardly able to move. It is good to take a few weeks (or months) to allow the body to adjust before going to steep angles. It is usually best to take a go slow approach. After a period of acclimation to inversion if you choose to hang at 90 degrees or full inversion and want to try sit-ups, inverted squats etc. this is not as much a risk as hanging free and attempting to enhance the stretch by arching and twisting. The sit-ups will exercise your abdominal and other muscles but not over-elongate the spine and thus risk overstretching muscles and other connective tissue. Many years ago we worked with an orthopedic surgeon who used inversion therapy extensively in his practice to avoid surgery with his patients. He had 8 tables in his office and we were amazed at the slight angles he would use for treating his patients. 10-15 degrees so their feet were only about 8" -14" above their heads - 2 times a day for about 20 minutes. Even with this slight angle he showed us x-rays that revealed improvement and told us about MRIs that showed it even better. We delivered many tables to his patient's homes and many of them told us of the many years they have been suffering and even surgery didn't help until they came to this doctor and started inversion therapy. Once your body begins to adapt to the excellent stretch the table offers it is great therapy to add a rocking motion to your program. Many people hang for 10-20 minutes then create a rocking motion where they rock back to a steep angle then come all the way up and repeat this process for a minute or two. This creates an accordion like pumping action and is believed by many to stimulate circulation to the discs and aid in their regeneration. Besides using the table to benefit the back, it is marvelous to hang for 15-20 minutes (at about a 30-45 degree angle) after a long day to get a recharge for the evening. The last thing to keep in mind is that if you hang on the table without shoes it makes it easier to slip out of the ankle locking mechanism. One technique many in the field believe is beneficial to helping to heal and regenerate the discs is to create a rocking motion. Often done for a few minutes AFTER a 15-20 minute inversion session at mild angles (coming up every 5 minutes or so to horizontal for a brief break from the traction). This rocking motion done after the inversion session creates a pumping action that facilitates circulation to the disc tissue which is infused by movement of the body. The rocking motion is done by rocking back to a 45-60 degree angle or so then rock forward so you are nearly upright then rocking back again. Doing this for a minute or so AFTER a 15-20 minute inversion session creates an accordion like pumping action that many believe can speed the recovery of the discs. This rocking motion is only recommended when one has been using the table for at least a week or two (or longer) and when pain symptoms are NOT present. One of the reasons discs degenerate and are difficult to regenerated is the nature of their passive circulation. Discs are not vascularised (full of blood vessels) like a kidney. Discs rely on body movement and breathing to get nutrients, fluids and remove waste products. This rocking motion or intermittent rhythmic traction is thought to facilitate a more rapid healing and regeneration process. When your are inverted a vacuum like pressure is created that pulls fluid into the disc and when you are upright the disc compressed and forces some fluid out. The rocking motion facilitates this circulatory process. We have had reports from people suffering with spinal stenosis that once they acclimated to inversion therapy the rocking motion aided them in reliving the pain. The movement of the vertibrae, discs and fluids seems to help many who have the condition of spinal stenosis. The reason the traction handles can be so valuable is basic body mechanics. 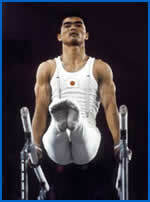 In this picture of Japanese gymnast Kato Sawao his arms are straight and locked similar to the position when you are gripping the traction handles. When his arms are straight the gymnast can use the strong muscles of his upper body to effectively move his body into swings and handstands etc. On the inversion table when the arms are straight it allows you to employ the same strong upper body muscles to increase decompressive traction on the spine without having to go to more extreme angles. The Traction Handles are an excellent adjunct to gravity therapy. Once the body has acclimated to inversion therapy and the muscles, tendons, ligaments, fascia etc. of the back are stretched out (a process that may take months) it is possible using the traction handles to increase the length of the spine enough to cause enough weight displacement to create the rocking motion. In order to create the rocking motion using the regular handles your arms are bent and you must bend and straighten your knees in order to get enough weight displacement to oscillate. Bending and straightening your knees in order change your position on the inversion table to create the rocking motion is quite effective. However, using the traction handles has the added benefit of causing additional decompressive traction on the spine. For example if you like the 45 degree angle (1/2 way between horizontal and vertical) but you would like additional traction without having to go to more extreme angles you can use the Traction Handles to add additional stretch to the spine without having to go to 60 or 90 degrees, which many not be comfortable for everyone. These EZ Stretch Traction Handles will fit on Teeter Inversion Tables produced after 2006. If you have an older table you will need new Roller Hinges (pivot arms). This is an additional $20.00 (if purchased in combination with the Traction Handles). If you are not sure about the age of your table and want the EZ Stretch Traction Handles, email us the serial # of your table which can be found on the back of the bed and we may be able to find out for you. $29.00 + $10.00 shipping add $20.00 if you need Roller Hinges - $59.00. In rare instances back pain is a symptom of a serious medical condition such as a kidney tumor or cancer. Even medical doctors sometimes make this mistake. We have seen cases of people being medicated for back pain when the actual problem was more serious. Why do some doctors advise against inversion therapy? For centuries traction had been one of the primary doctor prescribed therapies for back problems. Recently pain medication and surgical treatments became popular. Even though traction was recommended for centuries sometimes modern doctors will advise against inversion therapy. It has been our experience that one of the main reasons they advise against inversion is because they do not understand that the user has total control over the angle of incline and extreme angels that may concern the physician are not recommended nor are they usually necessary for achieving great benefits. What some doctors need to realize is that a person can set the table for horizontal or any mild degree of incline. When very mild angles are used the stresses on the body are minimal and any risks are reduced. We have heard from people over the years who avoided inversion therapy because their doctors did not understand the potential benefits. Some of these people found a different doctor who did understand how much benefit could be achieved with as little as 15-20 minutes a day of mild inversion and rhythmic intermittent traction. This is achieved easily with the inversion table by creating a rocking motion. Some doctors contraindicate inversion therapy for very good reasons. In most cases they have not taken the time to study this simple therapy that has brought pain relief and a better quality of life to hundreds of thousands of people. inversion therapy we offer a few suggestions. Begin slowly: Invert only 15 to 20 degrees at first, and stay inverted only as long as it feels comfortable, which may only be a few seconds at first. Remarkably, you can gain all of the benefits of inversion without ever fully inverting yourself. Most people find 20 to 60 degrees of decline adequate and very comfortable. Come up slowly: When you come back upright the pressure is again placed on the discs and nerves. Come up slowly and relax at the horizontal before coming upright. Make changes gradually: Increase the angle of incline only if it is comfortable, and only increase the angle a few degrees at a time. The Teeter Hang Ups EP-550, F9000 inversion tables have a tether strap to help people stay within their inversion range. People can add rocking back and forth (rhythmic traction) to their inversion program once they feel comfortable. Pay attention to your body: You're unique, and your body will tell you what's good for it. You determine the pace when adapting to the inverted world. Relaxing after a long day at a 25-45 degree angle for 15-20 minutes can be a great stress relieving & rejuvenating experience. Rhythmic Intermittent Traction: Use intermittent traction (pull and release) or rhythmic traction to encourage blood, lymph, and spinal fluid circulation. Moving, twisting, stretching, and light exercise while inverted aids in the alignment of bones and organs while minimizing any increase in blood pressure, but strenuous exercise is not recommended while inverted. Just relax and enjoy! Do it regularly: There are a variety of inversion programs and exercises. Trust yourself to find the approach that's best for you, and then do it every day. Two or three short sessions (15-20 minutes) a day seem to work best for most people. Inversion is a very dynamic & effective form of traction. Even at a 45 degree angle a person is achieving a greater force of pull on the back than hospital traction. The force of the pull registers much stronger on the body than it does on the conscious mind. This is why it iseasy to over stretch the muscles & nerves of the back and neck & possibly get a spasm. Remember, most adults have not hung upside down since they were little kids. Based on years of research and the testimonials of thousands of people who have found relief from back pain, inversion is a powerful, natural option for people who want to relieve lower back pain. Sometimes there's an explanation for why inversion works, and sometimes there isn't - it works for some and not for others. We only know that for many people, literally turning their world upside down through inversion therapy can provide an alternative to drugs and surgery in a life filled with daily pain. Many people say it is the greatest stretch they have had in years. Dr. Bernard Jensen who many consider to be one of the greatest naturopathic teachers and healers of the 20th century recommends using a slant board as part of an optimum health program. This inversion table does everything the slant board does and more!!! Good luck! Be Safe. Don't overdue it.